A good article here. Interesting to me that those finally embracing readiness in the last year have totally swamped existing preparedness supply lines ... and yet so very many more need to still wake up. The guy whose response was that he'll wait to get whatever he needs till the storm is on the horizon is typical. Most folks don't understand about our "Just in Time" supply-line limitations. MIAMI, May 30 — Convinced that tough tactics are needed, officials in hurricane-prone states are trumpeting dire warnings about the storm season that starts on Thursday, preaching self-reliance and prodding the public to prepare early and well. Cities are circulating storm-preparation checklists, counties are holding hurricane expositions at shopping malls and states are dangling carrots like free home inspections and tax-free storm supplies in hopes of conquering complacency. But the main strategy, it seems, is to scare the multitudes of people who emergency officials say remain blasé even after last year's record-breaking storm season. To persuade residents to heed evacuation orders, the Florida Division of Emergency Management is broadcasting public service announcements with recordings of 911 calls placed during Hurricane Ivan in 2004. "The roof has completely caved in on us," a woman cries as chilling music swells, only to be told that rescuers cannot come out during the storm. Speaking of the tactics, Craig Fugate, Florida's emergency management director, said last week at a news conference in Tallahassee, "We're going to use a sledgehammer." Horry County, S.C., home to Myrtle Beach, held a hurricane exposition last month and is giving similar presentations at Kiwanis clubs and homeowners associations. "The big shortfall is complacency with the community," said Randall Webster, director of Horry County Emergency Management. "Our main theme is, take interest as an individual and make preparations." But will it work? Emergency management officials groaned this month at a poll by Mason-Dixon Polling and Research Inc., which found that of 1,100 adults along the Atlantic and Gulf Coasts, 83 percent had taken no steps to fortify their homes this year, 68 percent had no hurricane survival kits and 60 percent had no family disaster plan. "I can't rightfully say I see any increased sense of people getting ready," said Larry Gispert, emergency management director in Hillsborough County, Fla., home to Tampa. "It's like a psychological issue — 'If I don't think about bad things, bad things won't happen.' "
In Nags Head, N.C., Jimmy Austin, a former commercial fisherman who now operates his own seafood market, said he was unfazed by this year's predictions, some of which suggest that the Carolinas will be especially hard hit. He keeps his insurance current, Mr. Austin said, but sees no need for special precautions. "I don't pay these things a whole lot of mind," said Mr. Austin, 69, a native of the Outer Banks. "Because they say so doesn't mean it's going to happen that way." In Galveston, Tex., Keith Patterson, a resident there for 30 years, dismissed the urgency of a hurricane survival kit on Thursday. No use worrying about a hurricane until it is near, he said. "When one is coming, I'll make preparations," said Mr. Patterson, 68, a retired purchasing clerk. "I'll get what I have to get then." In Florida, the second annual tax holiday on hurricane supplies, from May 21 through June 1, has not drawn an overwhelming response, several store representatives said. But at least one store, the Lowe's in South Fort Myers, was selling more generators than barbecue grills last week, said John Sandford, operations manager there. At a Home Depot, Brenda and Jerry Dyche of South Fort Myers were shopping for a generator last Wednesday. With that and a new roof, they said, they had no reason to flee. "We'd just as soon be in our house," Mr. Dyche said. "Where are we going to go? I-75 is a parking lot by the time they evacuate everybody." Likewise, Ronda Burke, who did not go inland last year to avoid Hurricane Rita but stayed on South Padre Island, Tex., to watch over her new health food cafe, Naturally's, said she would probably do the same this year if necessary. "We feel about our store like you feel about a person," said Ms. Burke, whose husband took their two young children to higher ground as Hurricane Rita neared the Texas coast (and eventually came ashore far from South Padre Island). "We'd probably ride it out again." Meanwhile, government agencies are preparing more thoroughly than ever, stockpiling water and food, improving communication technology and outfitting supply trucks with global positioning systems. Hattiesburg, Miss., is buying $4 million worth of generators for its public buildings and water system. Broward County, Fla., bought a $500,000 command post vehicle to shuttle emergency managers among crisis spots. Many areas will offer more hurricane shelters this year, though officials like Herminio Lorenzo, the Miami-Dade County fire chief, are portraying them bleakly to encourage people to make their own plans. "The very last place you would want to go is a Red Cross shelter," Mr. Lorenzo said last week at a community hurricane preparation meeting. "You're so close to the people sleeping next to you that you can feel the hair of their mustache on the side of your head." Some communities are coaxing the public to prepare in a piecemeal way, like saving old milk jugs as emergency water containers and buying one extra can of food on every grocery trip. Escambia County, Fla., is publishing weekly shopping lists to try to get residents to stock up little by little. Martiza Vazquez of Miami said that approach had made preparing more manageable. "Every time I go to the supermarket I buy four or five cans of tuna or soup or whatever," Ms. Vazquez, 37, said. "I have a checklist that came with the paper the other day, and I am using that to figure out how much is enough." Waiting for a taxi to take her to her job at McDonald's, Chanavia Williams of Galveston, who makes $5.75 an hour, laughed at the notion of buying provisions to sock away. "We got food, but I got none saved," said Ms. Williams, 17, the single parent of a 2-year-old, who lives in public housing. Ms. Williams said she would have to sacrifice buying diapers and baby clothes to afford a hurricane survival kit. Still, Ms. Williams, who evacuated on a bus as Hurricane Rita neared, said she wanted to prepare, echoing others who had frightening experiences last year. Wayne P. Sallade, emergency management director in Charlotte County, Fla., which was devastated by Hurricane Charley in 2004, said the Mason-Dixon poll numbers on hurricane preparation were skewed by people in states that had not had hurricanes recently. "You talk to people in cities here, and there's an absolute fever for information," Mr. Sallade said. That is also true in New Orleans and along the Mississippi coast, where post-Hurricane Katrina anxiety has compelled many to prepare diligently this year. But in Houston, Joe Laud, spokesman for the city's emergency center, said only 1,000 people with special needs had registered for public transportation to pick them up in an evacuation. During Hurricane Rita, Mr. Laud said, 25,000 such residents needed help evacuating. BOSTON, May 23 /PRNewswire/ -- News media are full of scary headlines about the H5N1 bird flu virus and the possibility that it might spread among the human population. Yet researchers note that no human flu pandemic has ever involved a flu virus of the H5 subtype. On the other hand, the H5N1 virus has already jumped from birds to pigs and cats, as well as infecting some people, suggesting it might have the capacity to develop into a flu that passes directly from one human to another. So should we be afraid -- or cynical? Neither, says the June issue of the Harvard Health Letter. No one knows for sure if H5N1 is going to explode or fizzle, or whether a different flu virus with greater pandemic potential might be out there. use may create resistant strains. Stay away from birds and their droppings. Stock up on water and nonperishable groceries. The recent letter to President Bush by Iranian President Mahmoud Ahmadinejad seems to have been largely ignored in the West as being irrelevant bloviation and just all-too typical denunciation of the ways of the west. However, there are some who view it as being a rather formal religious pronouncement or even a pseudo-diplomatic declaration of war on the United States. Whatever its purpose, it does paint an expansive picture of the intent of the Iranian regime, as it positions itself to inspire and drive the global jihad beyond the level of Bin Laden-esque hit-and-run operations. The Iranian president's letter needs to be taken seriously. ... what is known, or what should be known and deeply grasped, is that everything Ahmadinejad--and for that matter the radical movement as a whole--does is guided by an ideological vision and commitment. It needs to be addressed as such. For the moment and not only for the moment, this requires that liberal democrats declare that they have no intention of abandoning their way of life and see no need to do so, since they are fully prepared to defend it and because that way of life provides the resources--political, economic, and military--to defend itself. Of course the best person to make the first such declaration is President Bush--not as a Christian but as the world's leading liberal democrat. And not to Ahmadinejad, for whom a direct reply would be a victory, but to the Iranian people, the Muslim world, and the non-Muslim world. Hillel Fradkin is a senior fellow at the Hudson Institute and coeditor of Current Trends in Islamist Ideology. What is it that Worries Us Today? ... or at least a time when we're bombarded with unprecedented reinforcement from the media that we OUGHT to be worried about something, by golly. Every week there's something new to absorb through our outer calm. Sometimes, there are DAILY developments that need to be swallowed and digested. Eventually we get our fill. 1. The impending attack of Iran by the U.S. and Israel, using nuclear weapons, which will surely bring about a global apocalypse. 2. The impending attack by Iran on the U.S. and Israel, using nuclear weapons, which will surely bring about a global apocalypse. 3. The Bird Flu is about to start (or already has started) going head-to-head in the beginning of a human pandemic that will surely bring about a global apocalypse. 4. The Bird Flu is a total fabrication by the media (or by the global elite) designed to bring about a global apocalypse. 5. The U.S. and global economies are about to catastrophically deflate, bringing about a global apocalypse. 6. Numerous countries around the world are about to stop trading in dollars, a move which will collapse the US economy and end up bringing about a global apocalypse. 8. The illegal immigrant issue is about to spiral into a divisive civil war in the U.S. that will result in a global apocalypse. 9. Al Qaeda is moving into position to launch a massive, coordinated attack on the U.S. and western interests. The hope is to create the beginning of a global apocalypse and a Muslim paradise. 10. Geez ... I'm at 10 already, and I haven't yet mentioned cometary fragments, warmer waters in the Gulf of Mexico before the start of hurricane season, earthquake swarms, floods, droughts, caldara volcanoes, NSA spying on Americans, conspiracy and intrigue reaching across all organizational boundaries, political hunting and driving accidents, etc. Here's the real deal. For all the scary headlines and for all the antidepressant medications that are part of our daily life today, a person needs to develop a seriously oily disposition that will allow for all the stuff raining down to roll right off. 1. Connect spiritually with your Creator. 2. Disconnect literally from the media and the internet amateurs who daily are competing for your adrenaline. 3. Enjoy your family, friends, and your everyday life. 4. Nurture a healthy passion that you can feel good about feeding. 5. Allot a small amount of your time and resources to preparing logically for bad times. Do it, then forget it. Mountain House's production cycle replenishing their #10 can inventory will be completed in the next week. All backorders will be shipping post haste. For those of you holding your breath waiting for your March order, you should have your food by the end of the month. For those of you anxious to get into the queue, now is the ideal time to do so. Any orders placed in the next week should deliver in about a month. FYI, a couple of weeks from now, for all I know the situation could be totally different and there could again be inventory issues cropping up, once the demand surge starts peaking again. This article is right on the mark reflecting the situation for those of us in the preparedness business. What it doesn't mention is that only about 10% of the U.S. population who are familiar with the Avian Flu have done anything in the way of preparing for a pandemic to this point (see poll results). Even that 10% has swamped our little industry. Consider what will happen when a significant portion of the rest are prompted to suddenly do something. HEBER CITY, Utah - Harry R. Weyandt worries about a deadly flu pandemic reaching the United States for a different reason from most people: It would overwhelm his business. Nice on the bottom line. Murder on the nerves. There's no pandemic yet, and bird flu hasn't shown up in North America. But the staff at Weyandt's disaster preparedness store is already scrambling to keep up with demand for everything from freeze-dried foods to first-aid kits. "What I'm not looking forward to is when they announce the first bird with avian flu is in the country," said Weyandt, owner of Nitro-Pak Preparedness Center Inc. in Heber City, about 35 miles southeast of Salt Lake City. "Because I know what will happen. It'll be crazy here." Sales of emergency supplies are booming amid growing fears of a virulent global flu. Across the country, suppliers say they're already struggling to keep stock on hand, and it's taking longer to fill orders. Phyllis Hopkins of Best Prices Storable Foods in Quinlan, Texas, said the business barely had a breather between the Gulf Coast hurricanes last year and bird flu warnings that intensified over the winter. "We can't keep product in stock," said Hopkins, who runs the business with her husband, Bruce Hopkins. "As soon as it comes in, it goes right off the shelf." Pandemic panic buying means heady times for such businesses, which are typically family owned and have no more than a handful of employees. Weyandt said Nitro-Pak's March sales this year were up 600 percent from last year. He wouldn't reveal the company's finances, but said total sales last year were in the "mid-seven figures." Nitro-Pak's storefront warehouse looks like a cross between a Costco for survivalists and the post office before the Christmas holiday rush. Cardboard crates stacked floor-to-ceiling spill over with long-burning emergency candles, mini-rolls of toilet paper, waterproof matches and freeze-dried foods ranging from eggs with bacon to blueberry cheesecake. Scurrying between boxes, workers race to fill orders and load them onto heavy pallets that ship out every afternoon. Even Weyandt's office, a sparsely furnished affair not much bigger than a typical master bedroom, has desks overflowing with backpacks, compasses and space blankets. A strain of bird flu known as H5N1 has killed millions of chickens and more than 100 people worldwide since 2003, mostly in Asia. While the deaths are blamed on close contact with sick poultry, experts are afraid the virus could mutate to spread easily among people. If it arrives in North America, even businesses that stand to make a fortune say they're not prepared. "This industry is so teeny, that if something happens to get everybody in a panic, it can't handle it," said Richard Mankamyer, owner of The Survival Center in McKenna, Wash. In recent months, federal and state officials have been urging Americans to stock up on emergency supplies. At Oregon Freeze Dry in Albany, Ore., orders for its No. 10-size cans, which hold eight to 17 servings of food each, have jumped tenfold since the Gulf Coast hurricanes last year, said Melanie Cornutt, assistant manager. 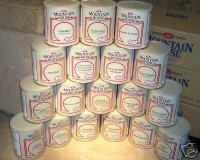 The company's Mountain House division is well-known for its line of backpacking foods. "We've gone through these spikes for 35 years now, but we don't try to keep a huge amount of inventory on hand because it's so hard to predict when the next one will hit," Cornutt said. In a worst-case scenario, federal officials say a pandemic flu might kill up to 2 million Americans and keep up to 40 percent of the work force at home for several weeks. Labels: How to be ready, Pandemic preparedness, Safecastle sales, Why prepare?